It was bruited on the backstretch this morning that the “real Colonel” was coming. A few Winstar Farm folks and trainer Eoin Harty were waiting for Colonel John the horse to return from his leg-stretcher-outer when the news leaked. The Travers-intended colt seemed to be enjoying the cool of the morning. Thursday dawned briskly with Adirondack air the way the tourist pamphlets say it’s supposed to. The “real Colonel,” reported Richard Downey, the crackerjack Kentucky Derby prognosticator, is a U.S. Army reserve lieutenant colonel named John Geider, a longtime friend of Winstar principles Kenny Troutt and Bill Casner. Geider is scheduled to arrive Friday, catch his namesake in the Travers on Saturday and head home to Kentucky on Sunday. Geider served in Iraq a few years back, and serves now as a “traveling secretary” for the Winstar owners, tending to such tasks as keeping an eye out for trouble and making sure security is in place. He’s an advance man of sorts. And a really good one it seems. “The real Colonel” is a nice friend to have, with the need for security everywhere. Saratoga’s backstretch is off limits to the public, although each morning 400 people who don’t belong there are there. Visitors arriving by trolley from the clubhouse are met by NYRA docents, and then escorted through the premises – first an introduction to a Thoroughbred, next a look at Clare Court, a short stroll through the barns and a few minutes to watch the workouts. There are five trolleys arriving each morning, and each trolley brings 80 people. 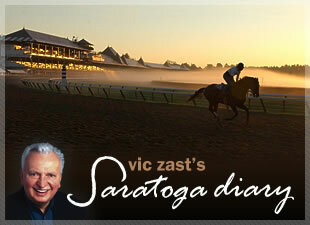 If you count the people having the buffet breakfast on the Porch and the people brown-bagging it in the stands, Saratoga hosts more visitors before 10 a.m. than most racetracks host in an afternoon. A small, but select, field of fillies and mares went postward on the Mellon Turf Course for the 20th running of the $200,000 Ballston Spa Handicap (gr. II). Wait a While, saddled by the meet’s leading trainer Todd Pletcher and ridden by the meet’s leading jockey J.R.Velasquez, beat Carriage Trail, a 10-1 shot, to the finish line. Given a luckier trip, the late-running Rutherienne might have caught them both. In the fifth race, the combination of 6-3-9-8 paid $102,977.00 for a $2.00 wager. Saratoga’s electronic tote boards weren’t programmed to display all these gaudy numbers. So the payout appeared as 02,977.00. Call Security to find that missing digit. Or wait a day for Colonel John Geider to get on it.